Deadly Klebsiella Plague from China Poses Public Health Threat to U.S.-Mostly Fiction! - Truth or Fiction? The deadly Klebsiella plague from China is coming to the United States, and citizens have been warned to take action. … the strains pose a substantial threat to human health because they are simultaneously hypervirulent, multidrug resistant, and highly transmissible. Control measures should be implemented to prevent further dissemination of such organisms in the hospital setting and the community. 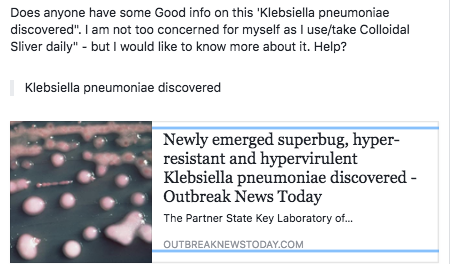 As it turns out, the drug-resistance of Klebsiella pneumoniae has been building since at least 2013. In that year, a study concluded: “This emerging problem presents a major threat to public health and warrants due diligence in future surveillance efforts.” So, the new strain’s highly transmissible nature adds to the previously identified threat of drug-resistance. But scammers have tried to cash in on that threat by making false claims about “the deadly Klebsiella plague from China,” and their ability to treat it. A group known as the Alliance for Advanced Health has warned that “a new bacterial plague from China is targeting American seniors this year,” and “it’s already killed its first American.” Then, on the same page, readers are encouraged to purchase a membership for its product, “Uncensored Health.” It’s built on the idea that the American medical community is trying to keep hidden from the general public. There are two main problems with rumors about the deadly Klebsiella plague from China.” First, we couldn’t find any confirmed cases of the new, hypervirulent, highly transmissible form of Klebsiella pneumoniae reported in the United States. There also haven’t been any credible public health warnings issued about it. In fact, there was no indication that Americans were at an elevated risk when the rumor went viral in March 2018. But it does remain a threat. Second, there are no known cures for the drug-resistant strains of Klebseilla pneumonia — which is what makes them drug-resistant. CDC researchers are currently working to use genomic sequencing to extract resistance gene data that could lead to development of a cure. Anyone who claims to have a cure would be years ahead of the world’s top researchers — which seems highly unlikely. HUD Secretary Ben Carson Ordered $31,000 Dining Set on Taxpayers' Dime-Truth! & Outdated! Cadbury Chocolate Eggs Are Infected With HIV-Positive Blood-Fiction!